The situation on this farm is not unusual. The footage was representative of the state of health of the general stock in this specific pen. In the interests of bio-security I did not use my equipment to film in any other pens. However, it has been verified with drone footage that the same state and extent of poor health was common throughout the farm. It is estimated that the site of 12 pens may hold around 400,000 salmon. Data shows that nearly 500 tonnes of farmed salmon have died in Loch Roag this year. I can testify that perhaps as many as 80% of the salmon I saw on the farm were suffering from severe sea lice damage. Perhaps as many as 50% with the mortal levels of damage shown in the images. If this were sheep or cattle in this state, with obviously no hope of remedial treatment I am in no doubt that a vet would recommend they be euthanised immediately. Not to do so would prolong unnecessary suffering. The stock in question has been verifiably in this state for at least eight days, but probably much longer. I was utterly shocked at the health of the stock and the very high proportion of fish in poor health with mortal sea lice infestation. 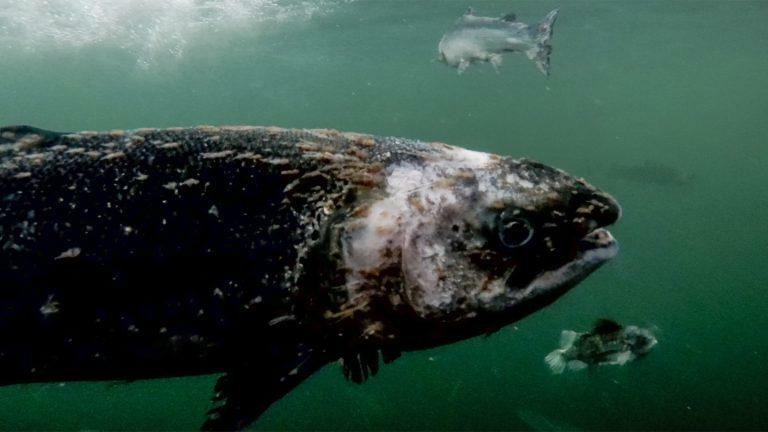 For fish to have reached this state of heath as a result of sea lice parasites eating their flesh, this situation would have had to occur over a matter of weeks. I am forty years old, twenty years born and raised on a working hill sheep farm. I am still an active member of the agricultural community. I am not squeamish or hysterical about the rearing of animals for food. But I have never in my life witnessed such extensive animal suffering, and over such a long period. At least 40% of stock need euthanised immediately on the grounds of compassion. Any responsible farmer would do that. I am sure the workers on the farm feel the same themselves, but policies and procedures seem to be preventing them from doing anything. Quite how this level of suffering and cruelty can be permitted is beyond me. I was born and raised on a tenant hill sheep farm of 2000 ewes near Blair Atholl. For the last five years, in my spare time, I have found myself accidentally researching and studying the operations and impacts of the 200 or so open-cage salmon farms throughout Scotland’s Highlands and Islands. I’ve tried to achieve a detailed, balanced and honest understanding of the environmental and economic impacts of the farms; as well as insight into the nature of the relationships between the multinational companies (that own the industry) and the Scottish Government and its agencies responsible for monitoring farm activities. I currently run two small businesses, The Wild Rise Company and Corin Smith Commercial Photography, as well as raising my beautiful young daughter and looking after my dog, Monty. Before that I worked as fly fishing guide around Africa and before that I worked for Betfair.com.